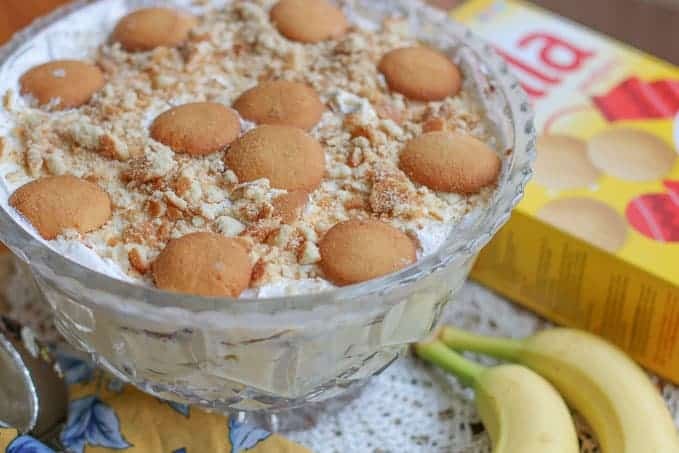 This is a delicious and easy Banana Pudding with sour cream recipe. The sour cream makes this pudding thick and creamy. It is the perfect no-bake dessert for cookouts, potlucks, and family gatherings. My kids do not like the old fashion baked banana pudding with the meringue. Weird right? What’s wrong with them? My children do however love this easy Banana Pudding with sour cream recipe. It is one of my son’s favorite dessert. This is another fix it fast, feeds many, everybody is happy kind of easy dessert. I often make it for cookouts, tailgates, potlucks, family gatherings, and the “just becauses.” It is brilliant because it is so simple to make with little thought or precision. You can whip it up the night before your next get-together and it is ready for you the next day. Or you can make it the day of. You will need it to refrigerate at least 3 hours for best results. Banana Pudding is one of the most popular desserts in the South. If you can make a good banana pudding, you will have many friends knocking at your door to make it. Believe me, I get requests for it all the time! This easy Southern Banana Pudding recipe is a little more thick in texture because of the heavy cream and sour cream. My family and friends prefer the thicker texture. It holds better with the bananas and it is more similar to the the old fashioned baked version. It tastes as if you put a lot of work and effort into making the banana pudding, but it really is so EASY!!! My friends ask for the recipe all the time. Good thing for them I have a blog, right? All I have to do is share this link. Good thing for you too…. because you have the recipe right here to make it! You are welcome! How Ripe Should your Bananas be for pudding? You want flavorful bananas in that pudding. After all, it is the star of the dessert. Therefore, you want the very ripe bananas. Look for the bananas that bananas with the deep yellow and brown freckle spots. Those will have the most flavor. Odds are, the bananas in the store won’t be ripe enough. If you can, plan a couple days ahead and let them ripen naturally. If you have 24 hours, throw them in a brown bag, seal them, and leave them alone until the next day. This will quicken the ripening process. * Cooking Note: I often serve my Southern banana pudding in a punch bowl as shown in picture. You can layer it in punch bowl or in a casserole dish. This is a delicious, quick and easy Southern Banana Pudding Recipe. It is perfect for cookouts, potlucks, and family gatherings. Mix pudding and heavy cream at a low speed until thick. Blend in sour cream and 1/2 of cool whip. Layer with first vanilla wafers, then banana slices, then pudding mixture. Repeat. End with vanilla wafers. You can crush a few vanilla wafers for a pretty topping. I love southern banana pudding. Isn’ it the best? Never tried adding sour cream into it and now I’m curious to give it a try. 2.Beat on medium speed just until soft peaks are formed. 3.Add sugar and continue mixing until stiff peaks form. I would think it would work.I haven’t tried it to be sure though. Can I use Greek yogurt in place of sour cream? I’ve never had a banana pudding made with sour cream! Making this for Easter dinner dessert! Yum! This was one of my childhood favorites! Thanks for sharing! 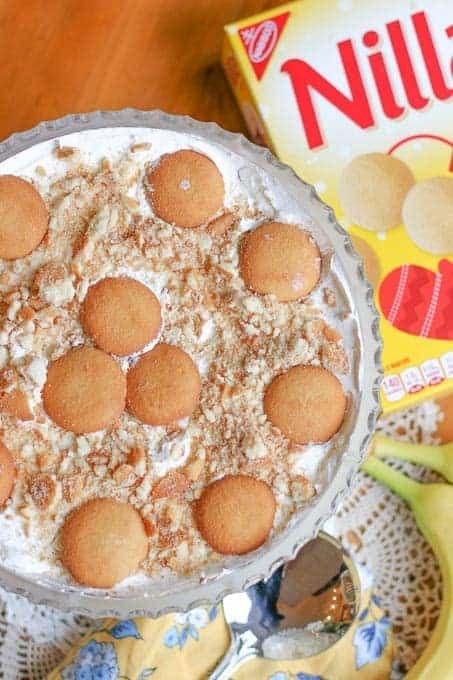 My family loves banana pudding, this recipe looks amazing! I’ll be making this as a special treat for them this week. Oh this pudding looks so good! What would be a good replacement for the cool whip as we don’t have it here in the UK ? Ohhhhh banana pudding has a soft spot in my heart. My Grandmother made the best one AND my husband says he stayed in the south for sweet tea, banana pudding… and of course me! lol! Love this recipe. 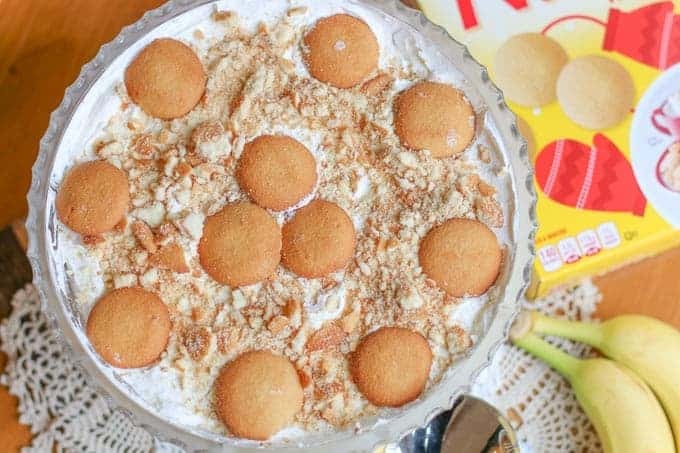 This Southern banana pudding looks like one of those desserts that is the first one gone at a picnic! Yummy comfort food! That looks like such a great party recipe! I’m sure everyone is happy to see you arrive at cookouts. I could dig into some right now. We love a southern style banana pudding. I am with your kids. Skip the meringue and go for a creamy topping. I need to get into Southern food, perhaps starting with this banana pudding! Is it okay if I have it for breakfast? This looks delicious. We don’t have cool whip in the UK. Is it like a cream or custard?